Hey there! Today I just wanted to pop-in and see if anyone else got Taylor Swift Reputation tour tickets? My friend and I had a calendar notification go off 5 minutes before tickets went on sale to remind us to be on Ticketmaster as soon as they became available yesterday! We’ll be seeing Taylor here in Miami next summer :). 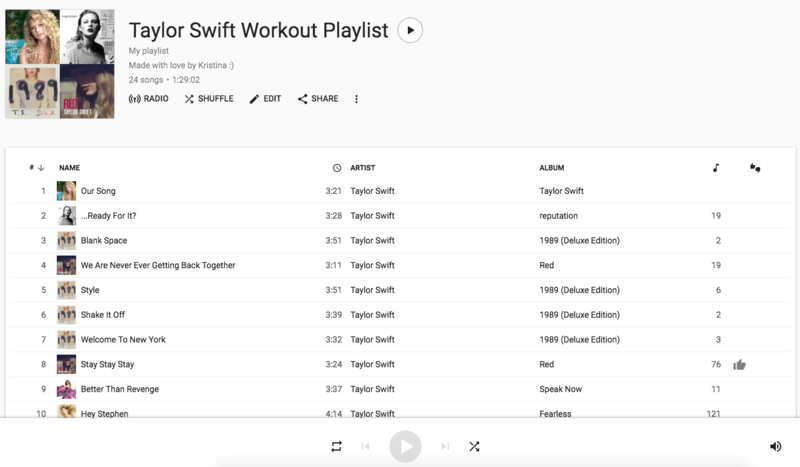 This will be my first Taylor concert so I thought I would share a fun Taylor Swift Workout Playlist with all of my favorite Taylor songs to run to and just generally workout to! If you have a Google Play Music account you’ll be able to listen to it through that link, otherwise you’ll need to re-create the playlist in whatever streaming service you use if you want. Getting Taylor tickets made me think of all the concerts I’ve ever been to. The first concert I ever went to was Celine Dion with my mom when I was 12. Right after that I saw my second concert ever: *NSYNC featuring Britney Spears as their opening act! This was right after Baby One More Time came out, so crazy! The best concert I ever went to was seeing *NSYNC during their Celebrity Tour at Raymond James Stadium. It was the height of their popularity and my friend and I got 4th row floor seats. We were THISCLOSE to the guys and the concert was AMAZING! I will never, ever forget that night! I’m looking forward to seeing Taylor next year, and to also add another Maroon 5 concert to my name as well :). AND hopefully Justin will come out with a new album and tour too. That would make it an epic concert year for me! What concerts have you been to? Who is your favorite artist you’ve ever seen live? 4th of July Running and Fun! Next Post Need Your Help: Where Should We Go? Ohhhhh I would LOVE to see Alanis in concert! Does she still tour? I need to look that up! I can only imagine what seeing Aerosmith in concert is like, I bet that’s awesome! I have dragged Adam to a few concerts he has no interest in like Maroon 5 and the Justin Timberlake/Jay-Z join concert for the 20/20 Experience. He doesn’t love the music but he always says they put on good shows :). I do not know if she still tours. She was actually my first concert ever. I was 14 and the concert was on the first day of HS. My mom drove me and 4 friends to Hershey Stadium, dropped us off, and sat in the parking lot until it was over. This was back when there were no cell phones. I can’t believe she let us go in there alone! How did we find her at the end of the concert???? I went to the 1989 tour, it was so much fun! I thought about trying to get tickets this time around…but then remembered how expensive grad school is. You’ll have to tell me all about it! I seriously regret not going to the 1989 tour – that is definitely my favorite TS album of all time (so far). I just don’t know if any other songs could top Style or Wildest Dreams, those are by far my faves!!! I hear ya on grad school. I can’t remember doing anything fun during grad school except staying up late to write research papers :).